The Helix Nebula is a planetary nebula - a dying star that is blowing off shells of gas. The nebula's beautiful shape is the result of several outbursts which created rings around the star. The inner ring is about 1.7 light years in diameter, while the outer ring's diameter is about 2.5 light years. Astronomers believe that the Helix Nebula is one of the closest planetary nebula to us at a distance of about 650 light years. Be sure to look for the nice background spiral galaxy shining through the Helix nebula at the bottom of the planetary (next to the bright star at the bottom edge). In this photo, North is to the left. This image is cropped to 68% of the original full frame. Software Used Images Plus 4.5 for camera control, calibration, stacking, digital development, Lucy-Richardson deconvolution, multiresolution sharpening, smoothing and noise reduction. Photoshop CS5 used for levels and curves, color correction, high pass filter, star shrinking, saturation adjustments, lab color, vibrance, match color, and screen mask invert. Gradient Xterminator for gradient removal. Carboni Tools for additional saturation adjustments, noise reduction, and smoothing. HLVG for additional color correction. Notes Although I imaged this object for a lot of hours (16), I'm overall disappointed with the final result. I was trying to capture the faint outer nebulosity. Unfortunately, almost every night I photographed this object, I had very poor transparency. I had a lot of problems with high clouds, and the object is fairly low in the sky looking more or less towards Los Angeles. Consequently, I wasn't able to bring out the faint parts I wanted. 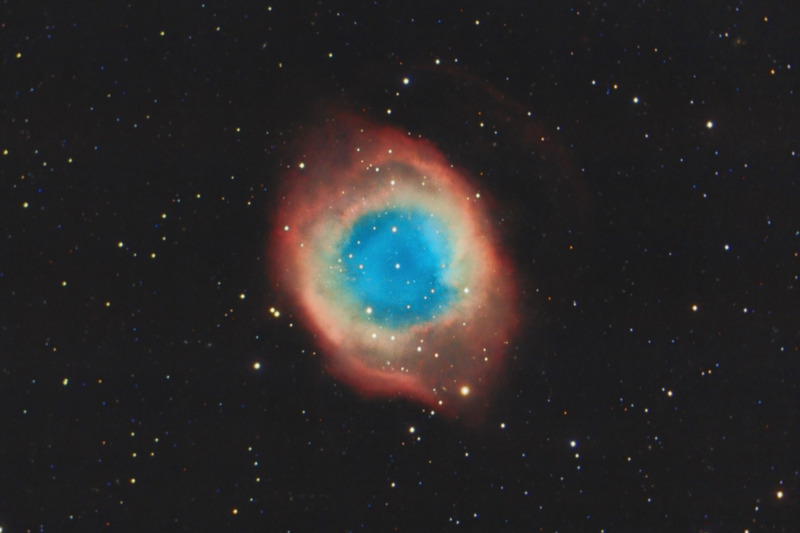 The Helix Nebula is a beautiful planetary, so this colorful image still looks pretty good. I'll probably try it again next year and try to pick some more optimal nights to photograph it.